1. A structure on the roof of a building covering a water tank, shaft, or service equipment. 2. A structure, as on a roof, covering a stairwell or other opening, to provide adequate headroom. 3. A retaining structure to prevent earth movement into a dredged area. 4. 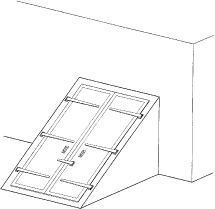 A horizontal or inclined door giving access from the outside of a house to a cellar or to a shaft. 5. The member of an entrance frame which forms a base for a sidelight adjacent to a door. 6. In a concrete form, a partition which blocks fresh concrete from one section of the form or closes the end of the form (as at a construction joint).